Franz Wickhoff’s methods of narration – in comics? the isolating method: each scene of a story is depicted in its own image, clearly separated from the others. the continuous method: different scenes of a story share the same background, so that the image of one scene continues into the next one. the complementary method: all scenes of a story are depicted in one single image. Obviously, comics with their panel borders usually use the isolating method to tell their stories. There have been attempts by comic scholars to use all three of Wickhoff’s narrative methods in definitions and classifications of comics, e.g. by Eckart Sackmann in 2006 (in German). What I’m more interested in, though, is if we can find examples of continuous and/or complementary narration in comics that predominantly use isolating narration. To test this, I picked up a comic that I happened to be reading (not a scholarly sampling method, mind you), the French edition of J. P. Nishi’s パリ 愛してるぜ~ / Paris aishiteruze (À Nous Deux, Paris! in French). And sure enough, there are plenty of examples of continuous narration on the first couple of pages already. 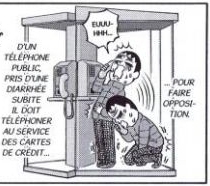 Consider, for instance, an image on the third page (p. 5 in the Philippe Picquier edition): the same figure is depicted twice in a telephone booth, standing up and kneeling. The effect of this use of continuous narration is to emphasise the suddenness of the young man’s diarrhea attack – in one moment he’s still able to stand, in the next moment he isn’t anymore, but the time between these two moments is too short even for a panel transition. This kind of continuous narration is fairly common in humorous comics, but I have yet to find an example of the complementary method in comics. I can imagine that certain kinds of short episodes within a story, such as dreams, or events narrated by a character, lend themselves to the complementary method. In his opening speech, Dietrich Grünewald mentioned Jacques Callot’s series of etchings, Les Misères de la Guerre, as an early example of a political picture story. I wondered if this series is available digitally in its entirety somewhere on the web. This doesn’t seem to be the case: all 18 prints can be found, but not in one place. The most complete sites I could find are an article by Katie Hornstein (plates no. 2-6, 8, 10-11, 15-18), and a website of the Université de Liège (4, 6-7, 9, 12-13, 17). The remaining plates (1/title page and 14) can be found at Wikimedia Commons. Louise C. Larsen mentioned Peter Kürten in her talk, a German serial killer in the 1920s and 30s. His English and German Wikipedia entries are quite detailed. Kürten’s case is quite similar to that of Fritz Haarmann, which has already been adapted into a comic by Peer Meter (German homepage: http://peermeter.de/ – see also Juliane Blank’s talk at last year’s ComFor conference): both committed their crimes at around the same time, both were called “vampire” (“vampire of Düsseldorf” and “vampire (or werewolf) of Hanover”, respectively), and the brains of both were examined and preserved by scientists after their execution. In Rikke Platz Cortsen‘s presentation on Rasmus Klump (a.k.a. Petzi), I saw the original Danish strips for the first time, and realized that the German translations are drastically shortened. Furthermore, the German translations vary from edition to edition: the German website http://www.petzi-forschung.de offers an interesting overview of all the German editions. Was Martin Frenzel‘s presentation the longest ever (338 slides)? Not even close. The longest I found on slideshare has 919 slides, and there’s a YouTube video consisting of 1604 slides (although I doubt that these were really shown in a talk). Hartmut Nonnenmacher mentioned a Spanish comic creator called Kim. Could this be the same Kim who was the artist on the German comic Kleiner Thor? No, they are two different people: the Spanish Kim’s real name is Joaquim Aubert Puigarnau (cf. his Spanish Wikipedia entry), whereas the other Kim is from Germany and called Kim Schmidt (German Wikipedia). 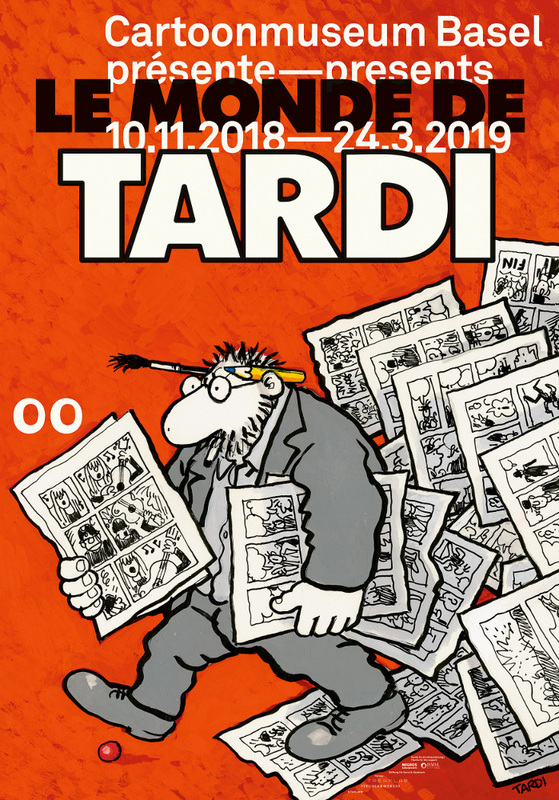 “For the first time, the legend that is Asterix and its archaeological roots are shown”, that’s what the Völklinger Hütte says about its current exhibition (December 17, 2011 – April 9, 2012). And, granted, that much is true: we get to see Asterix comics, and we get to see archaeological objects. Therefore, it wouldn’t be correct to call this show fraudulent. And that’s about the most positive thing I have to say about it. But let’s start with what there is to see in this 6.000m² exhibition space. There are over 120 original pages from Asterix comics. However, as a text at the beginning of the exhibition tells us, they (or at least some of them) aren’t really originals, but rather facsimiles. Furthermore, most pages are the final, coloured proofs, which (naturally) look exactly like in the printed albums. I find it pointless to exhibit such pages, and I would have preferred to see sketches instead. On some pages it is interesting to compare the original French texts to their German translations, but the accompanying texts on the walls next to the pages don’t comment on that. In fact, the accompanying texts don’t refer to the exhibited pages at all, but rather to the content of the albums they are taken from. So what about the archaeology part? In the vicinity of the comic-related objects, there are glass cases with the sort of Celtic and Roman artifacts you would expect: weapons, armours, pottery, utensils and the like. Now, I’m not an archaeologist, and I can’t say if these artifacts are particularly interesting in themselves. Who knows, maybe they are. The problem is: the exhibition doesn’t even try to connect them to the comics. For instance, there is a case with a replica of a Roman armour, and nearby there’s a picture of Obelix as a Roman legionnaire on the wall. When I compare the replica armour to the one that Obelix is wearing, I can see there are some differences. So why did Uderzo draw it like that? Didn’t he have access to models or pictures of Roman armours? Did he model it after a different real Roman armour that isn’t exhibited in Völklingen? Did he just simplify it to make it easier to draw, or alter it to achieve an aesthetic effect? Did he even care about historical accuracy at all? I thought answering such questions was what this exhibition was all about. But just what it is about must have escaped my notice entirely. Oh, and don’t expect to find the latest German edition of Asterix albums (“Ultimative Edition“) in the museum shop. The salesperson there hadn’t even heard of it, although you can read about it on the publisher’s website on a computer terminal in the exhibition. 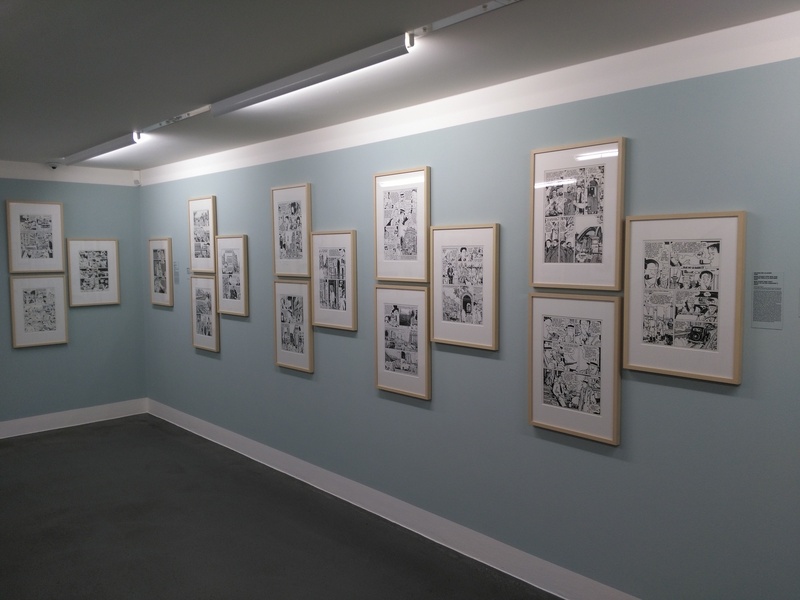 Don’t get me wrong: I do think it is possible to make good exhibitions about comics. “Asterix & Die Kelten” just isn’t one of them. 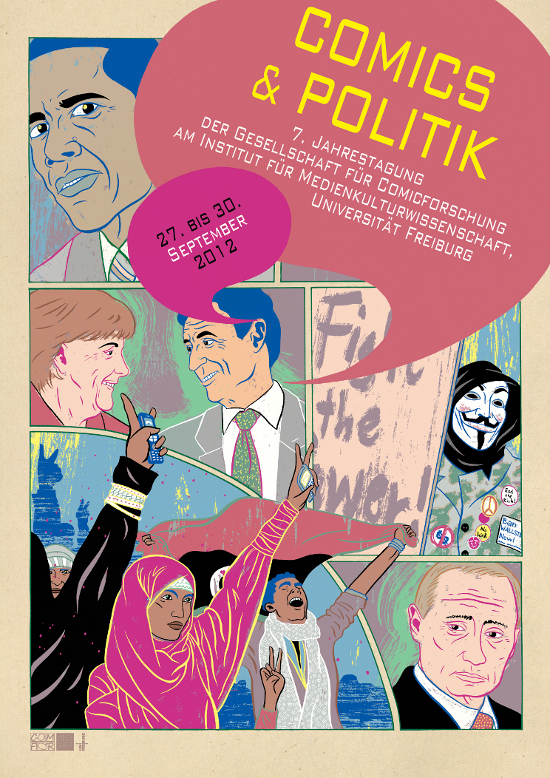 For the record, the exhibition is accompanied by a lecture series (see also the German post on the ComFor weblog).